Name badges are wonderful introductory tools. They make it easy for people to learn your name and remember you. Additionally, they increase the likelihood that you will make a lasting impression and increase your chances for future work possibilities and/or appraisals. You may say your name once when you introduce yourself, however some people just may not hear you properly or misunderstand. With a name badge, they will be reading and absorbing your name, while being introduced or listening to you. This increases the chances they will both remember your name and feel connected. 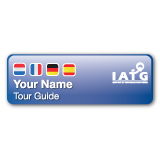 The clean and clear design of the new style IATG name badges makes it easy for people to see your name, the IATG logo and the languages you speak at a glance. 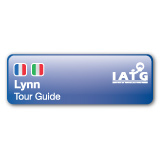 These name badges are available to Professional Members and have a pin or magnetic attachment. 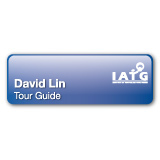 The “Tour Guide” title is mandatory.